What is a Router Bridge? A Router bridge connects two or more routers to extend the range of your network, providing additional Ethernet ports and wireless access points. But before you begin, you must first decide how each router will be used. Therefore, you need to know what you are trying to achieve and get clear on what you expect from each device. For example; do you want to extend your WiFi range, partition your network into subnets, or bridge two networks together? 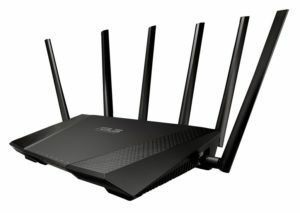 And, how will these two routers be connected, with an Ethernet cable, or over a wireless bridge? In this section we’ll cover how to connect two routers (router behind router) using an Ethernet cable. Using an Ethernet cable is the easiest way to connect two routers. Setting up a wireless bridge isn’t much more difficult but there are some things to consider regarding performance. Most Tomato firmware mods offer five wireless modes to choose from and I’ll cover each one individually in a later tutorial. 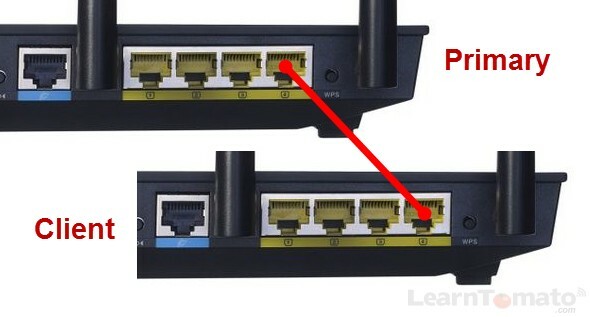 For now, let’s stay focused on how to connect two routers with an Ethernet cable. For the sake of this tutorial, the term “primary” represents the “host” router. TIP: It is not recommended to run Ethernet cable in excess of 100 meters (328 feet) when connecting two routers. I also recommend using Cat5e/Cat6 cable for maximum throughput. If you are running older routers, you can get by with Cat5 cable, but with today’s Gigabit Routers, use Cat5e or Cat6 cable to get the most performance out of your connection. 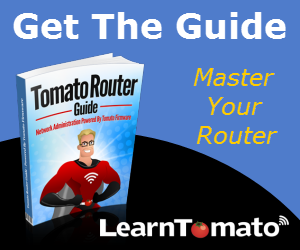 There are a number of ways to connect two routers. For now, we’ll cover the most common methods when using an Ethernet cable. From this point on, router #1 will be called ‘Primary’ and router #2 will be referred to as the ‘Secondary’ or ‘client’ router. With option #1, you connect the LAN port of the client router to the LAN port of the primary router (do not use the WAN port on the client router). This is the most popular option. For one thing, it creates a single LAN. As a result, its much easier to share files and printers with other devices on the network (regardless of which router the client is connected to). IMPORTANT: A router separates two networks. In most cases, it separates your LAN network from the Internet and allows certain traffic a right of passage. Therefore, because the client router is not connected to the Internet/WAN port, many of the routing functions will not work. The “routing” functions that the router would normally perform will be handled by the primary router. Therefore, DHCP must be disabled on the secondary router. As a result, Your client router should have an IP address in the same subnet as the primary router. So, if the primary router has an IP address of say, 192.168.1.1, you could set the IP address of the client router to 192.168.1.2. With this option, both routers are in the same subnet (192.168.1.x). Again, the primary router handles all routing and DHCP functions. With this option, you connect the WAN port of the client router to one of the LAN ports of the primary router. In this case, if your primary router uses the IP address 192.168.1.1, the client router might use 192.168.2.1. This way, the client router can have DHCP enabled and handout its own IP addresses. 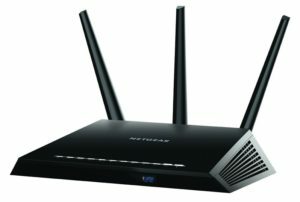 When you place a router behind a router as seen in option #2, be aware that this can cause some strange communication issues. Even though your client router is on a different subnet, this option doesn’t provide true segmentation of the network. 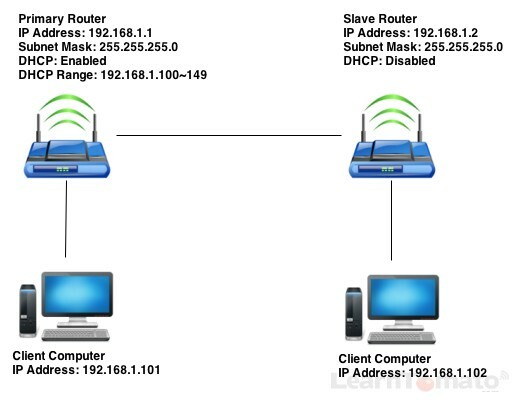 For example; computers connected to the client router will be able to reach computers connected to the primary router, but not the other way around. Therefore, computers connected to the primary router will be unable to reach computers connected to the client router. For this reason, option #1 is generally the best option to connect two routers and extend the range of your network.